Join Us!!! We are looking for someone to help us cover EABC basketball. Please send us an e-mail. The six teams participating in the East Asia Basketball Association (EABA) Championship 2017 were determined on Monday and then found out what groups they would play in as a result of a draw. This year's edition of the biennial event will take place in Nagano, Japan, from June 2-7. In the Group Phase, the six teams will be divided into two groups. Group B: China, Taiwan, Hong Kong. In the first round, each team will play the other two teams in their group once. The top two teams from each group will advance to the Semi-Finals. The 3rd place team in each group will play for 5th place in the tournament. The two Semi-Finals winners will advance to the Final, and the two Semi-Finals losers will dispute 3rd place overall. The EABA Championship 2017 serves as a qualifier for the FIBA Asia Cup 2017 that will be held in Beirut, Lebanon from August 10 to 20. The top five teams from this competition will earn tickets to the continental tournament. The last EABA Championship was held four years ago in 2013 in Incheon, Korea, where the hosts prevailed in the Final against China, 79-68. Japan took 3rd place home over Hong Kong, 87-71. Taiwan celebrated the first ever EABA title. They rallied past South Korea in the Final in Nagano today. Quincy Davis (206-F/C-83, college: Tulane) had another pivotal performance for Taiwan as he scored 21 points and grabbed 13 rebounds to pace the winners. South Korea jumped to an early lead. They raced off to a 20:15 advantage. Taiwan responded with a 24:14 surge in the second term to secure a 39:34 halftime advantage. They poured in 24 points in the third term to open a 12-point lead. Taiwan held South Korea to just 13 points in the fourth quarter and marched to the triumph. 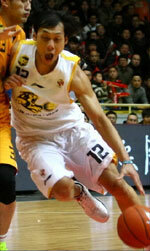 Cheng Liu (192-F-90) delivered 23 points for the champions. Heo Il-Young (197-F-85) responded with 18 points for South Korea. Jong-Hyun Lee (206-C-94) had 13 points and 7 rebounds in the defeat. Japan wrapped up their Nagano campaign on a winning note. 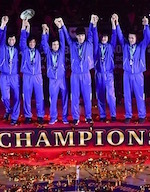 They dropped China in the consolation final and claimed the Bronze medals at the championship. Ira Brown (193-F-82, college: Gonzaga) came up with 21 points and 11 rebounds to pace the hosts. Japan set the tone in the opening frame. They went on a 26:9 run to clear off. Japan protected the lead throughout the reminder of the contest and marched to the victory. Kosuke Takeuchi (206-C/F-85) delivered 11 points for the winners. Zhao Yanhao (195-F-97) responded with 20 points for China. Jinqiu Hu (208-C-97) had 14 points and 14 rebounds in the loss. Taiwan secured their Final birth in Nagano. They upset hosting Japan in the semifinal clash tonight. Quincy Davis (206-F/C-83, college: Tulane) was unstoppable for the winners accounting for 29 points and 17 rebounds. Taiwan dominated in the first half. They registered a 40:26 halftime advantage. Japan came back to life after the long break. The hosts got within striking distance in the fourth period but could not deliver the final blow as Taiwan got away as the winners. Yi-Hsiang Chou (190-G-91) and Chiang Yu-An (174-PG-91) provided 10 points each for Taiwan. Makoto Hiejima (190-G/F-90) responded with 20 points for Japan. South Korea advanced into the title game in Nagano. They held off China in the semifinal thriller today. Heo Il-Young (197-F-85) stepped up with 22 points to pace the winners. South Korea secured a 45:36 halftime lead. But China poured in 32 points including a late bucket from MingHui Sun (192-SG-96) to force overtime. South Korea though answered with 13 points in the extra period to eke out victory. Jong-Hyun Lee (206-C-94) delivered 20 points and 6 assists for the winners. MingHui Sun responded with 28 points, 7 assists and 5 rebounds for China. Hong Kong finished their tournament's campaign on a winning note. They beat Macau to claim the fifth position. Leung Shiu Wah (189-SF-94) provided 19 points to lead the winners. Hong Kong used a massive 29:9 surge in the second term to build a 26-point halftime lead. They never looked back afterwards cruising to the win. Reid Duncan (206-C-89) and Chun Wai Wong (196-C-85) accounted for 14 points each for the winners. Kam Chi Un (200-C-93) responded with 26 points for Macau.